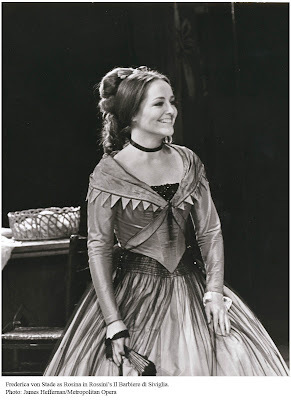 Shortly after my last post regard mezzo-soprano Frederica von Stade, I went on a listening frenzy. 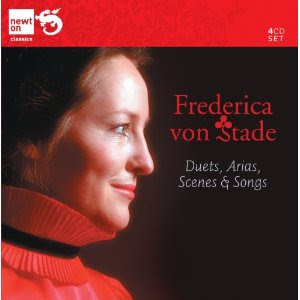 Recently released on the Newton Classics label, Frederica von Stade: Duets, Arias, Scenes & Songs is a 4-disc set that wonderfully captures a snapshot of Frederica von Stade's one-of-a-kind artistry and demonstrates the technical prowess on which this star mezzo-soprano built her stellar career. Brilliantly paired with soprano Judith Blegen, disc 1 showcases a wealth of beauty and an attention to detail that we so rarely see in today's current array of singers. Recorded with the Chamber Music Society of Lincoln Center, this recording ranges from purely stunning Robert Schumann duets, to von Stade's first recording of Cherubino's "Non so piu" - an arrangement by Mozart for violin and piano. The second disc in the set trots out the kind or recording that everyone, who is worth their salt, does. But, von Stade's Italian Opera Arias is not your usual Verdi sing-a-long... for reasons outlined above. Cleanly negotiating Rossini's "Bel raggio lusinghier" from Semiramide could give many other mezzos a tutorial in comfortably singing Rossini - as opposed to what many do: fire off as many fireworks as possible, thus overwhelming their audience. Joining forces with mezzo-soprano Janice Taylor, von Stade also amazes in Monteverdi's "Torna, torna" from Il Ritorno d'Ulisse in patria. The use of breath control - and thus, legato line - leaves me with a severe case of goosebumps. No joke. Showing off her stunning aptitude for the Art Song, Frederica von Stade gives us quite an array of heartfelt songs from John Dowland, Henry Purcell, Franz Liszt, Claude Debussy, Joseph Canteloube and Carol Hall. Accompanied by master-collaborator Martin Katz, the Song Recital recording on disc 3 is sure to inspire you to pull out your Art Song books and get to work. Speaking of Art Song - disc 4 is of particular interest to me. A self-proclaimed Mahler nut, I am over the moon. Andrew Davis (before he was SIR Andrew Davis) conducts the London Philharmonic Orchestra and von Stade through "Lieder eines fahrenden Gesellen", Ruckert Lieder and two songs from "Des Knaben Wunderhorn". While Davis shows off his buttoned-up, English side in his conducting - the pieces on-the-whole show a youthful animation and buoyancy from the then 35-year-old conductor and 34-year-old singer. If you are looking to take a tour of Frederica von Stade's career, Frederica von Stade: Duets, Arias, Scenes & Songs is not the recording set for you - as it does not cover the large number of operatic roles that she performed (Strauss, Rossini, Mozart... and even a little Verdi and Bellini). But, it should - most definitely - be on the top of your "To Buy" list.